Most people in the world today think democracy and gender equality are good, and that violence and wealth inequality are bad. But most people who lived during the 10,000 years before the nineteenth century thought just the opposite. Drawing on archaeology, anthropology, biology, and history, Ian Morris explains why. Fundamental long-term changes in values, Morris argues, are driven by the most basic force of all: energy. Humans have found three main ways to get the energy they need–from foraging, farming, and fossil fuels. Each energy source sets strict limits on what kinds of societies can succeed, and each kind of society rewards specific values. But if our fossil-fuel world favors democratic, open societies, the ongoing revolution in energy capture means that our most cherished values are very likely to turn out not to be useful any more. 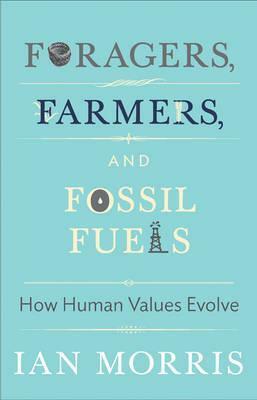 Foragers, Farmers, and Fossil Fuels offers a compelling new argument about the evolution of human values, one that has far-reaching implications for how we understand the past–and for what might happen next. Originating as the Tanner Lectures delivered at Princeton University, the book includes challenging responses by classicist Richard Seaford, historian of China Jonathan Spence, philosopher Christine Korsgaard, and novelist Margaret Atwood.